Each year, Americans alone throw away more than 70 million tons of packaging, making up the largest percentage of landfill waste. Pratt Institute student Aaron Mickelson based his master’s thesis project on drastically reducing the amount of packaging that is used in consumer products and subsequently thrown out. His project, called The Disappearing Package, is an inventive new look at the way we use our products. 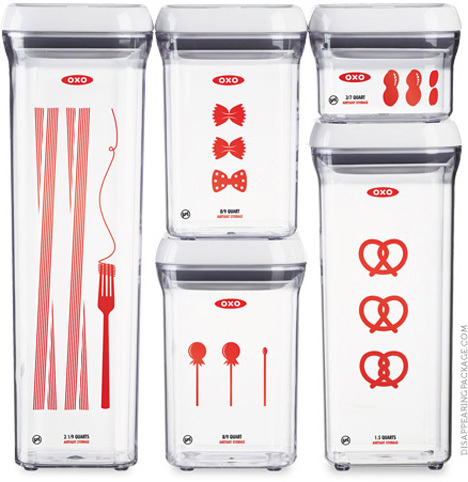 Each of the products depicted in The Disappearing Package features packaging that becomes part of the product. 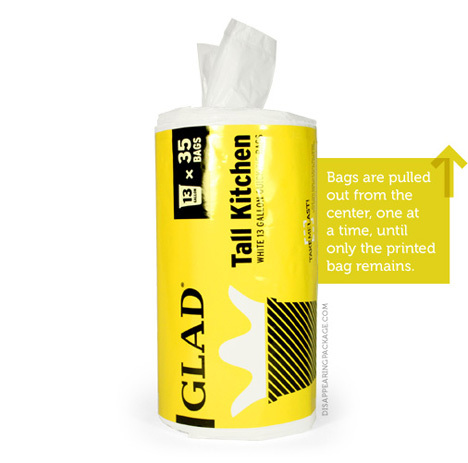 The conceptual package for Glad trash bags involves a roll of bags with one printed bag bearing the information about the product. The consumer pulls bags out from the center of the roll, one at a time, until only the printed bag is left. This reminds the consumer what product to buy on their next trip to the store – and the printed bag is then used just like any other trash bag. 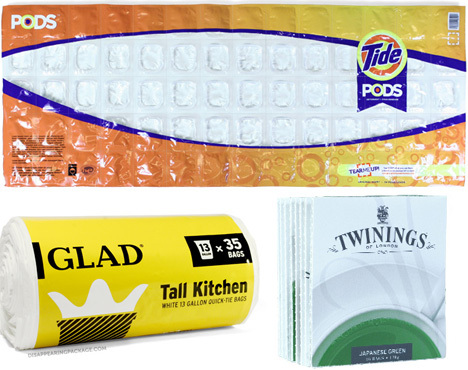 The Tide PODs package eliminates exterior packaging by simply making the PODs in a single sheet with perforations between each. 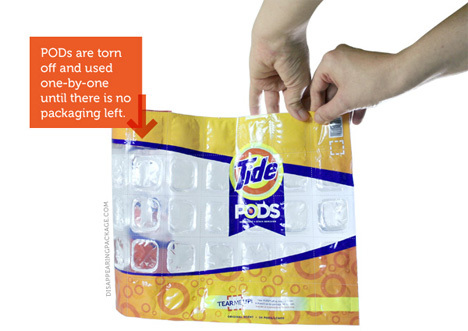 Detergent pods with dissolving plastic exteriors are already in use; these Tide PODs would use the same dissolving plastic along with water-soluble inks that would simply vanish in the wash.
Twining tea packaging is made simpler by eliminating the cardboard box and plastic over-wrap that usually holds the bags. 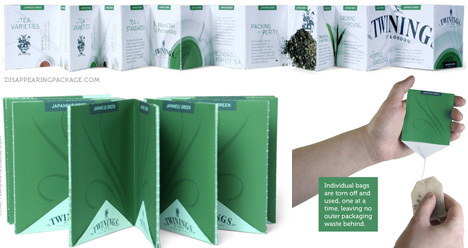 Instead, each tea bag is held within a paper envelope and each envelope is attached to the next via perforated seams. These attached paper packages are folded in an accordion pattern, leaving a large printable area for the manufacturers to print information directly onto. There is still some waste but, as Mickelson points out, there probably always will be where food packaging is concerned. Soap typically comes in a cardboard box that is discarded immediately. 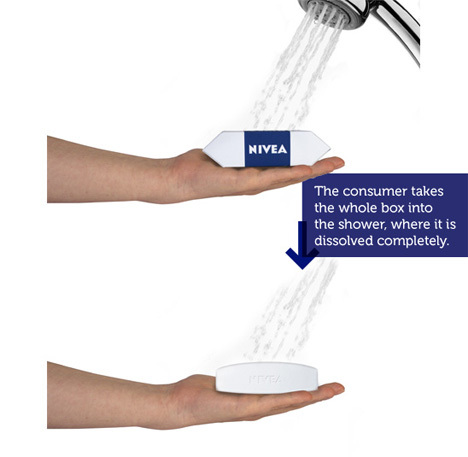 The Nivea soap Disappearing Package is designed to be difficult to open in order to remind consumers to take the whole box into the shower. The box dissolves under water, leaving no trace behind. It is septic-safe, meaning that consumers wouldn’t have to worry about the dissolving package causing plumbing problems. When we buy new reusable food containers, most of us wash them before putting food inside. Mickelson’s project exploits this tendency by printing pertinent information directly onto the containers with soap-soluble ink. As soon as the consumer washes the container with soap and water, the printing comes right off. This eliminates the slip of printed cardboard that is currently put inside the containers to convey information about these reusable vessels.